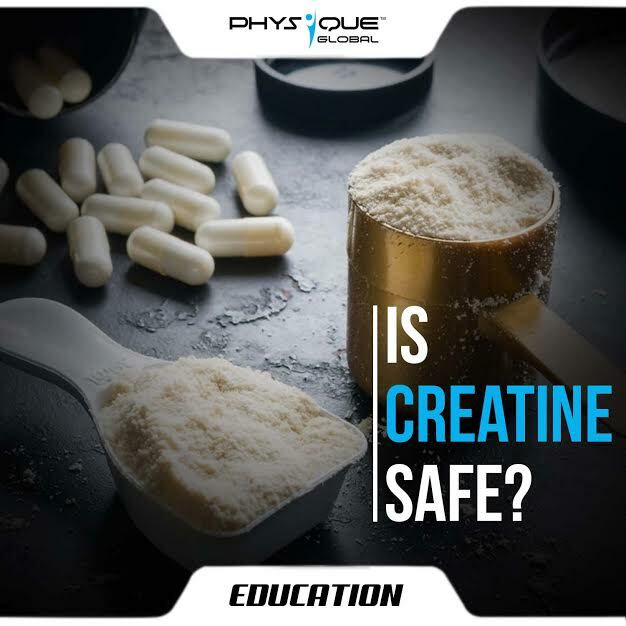 Home · Physique Global Article · Is Creatine safe? Creatine is an organic acid that our bodies naturally make, and that we get by eating certain foods — seafood and red meat, in particular. In the body, 95% of creatine is stored in the muscle and the remaining 5% is distributed in the brain, liver, kidney, and testes. Creatine acts as a very rapid, but limited source of energy for very high-intensity muscle contractions and it is thought to work by increasing the body’s store of Creatine-Phosphate. It provides energy rapidly when doing high-intensity explosive movements. Creatine is ideal for anyone that is looking to increase their strength and power during short duration, high-intensity exercises and to increase their lean body mass during training. Creatine is one of the most researched sport supplement ingredients proven to enhance strength and mass with training. It is one of the select few supplement ingredients to have been assessed by the International Society of Sports Nutrition (ISSN). Creatine is often blamed for causing excess water retention (bloating). While it is true that it increases overall weight due to water retention, you shouldn’t see this as a bad thing. About 70%-75% of your muscles are made up of water and a well-hydrated muscle has a higher anabolic rate leading to muscle growth. In regards to its dosage, studies have shown that taking a maintenance dose of about 5 grams a day would be ideal to get reap all the benefits. The bottom line is that creatine monohydrate is a very well researched and safe supplement and unless you have any health related issues (like experiencing kidney problems or having diabetes) you shouldn’t have problems with it.